Unfortunately time constraints (i.e my day job) keep getting in the way of me updating this site so all Ive been able to do so far for the Stokme City Nickname page is a very basic bit of background. 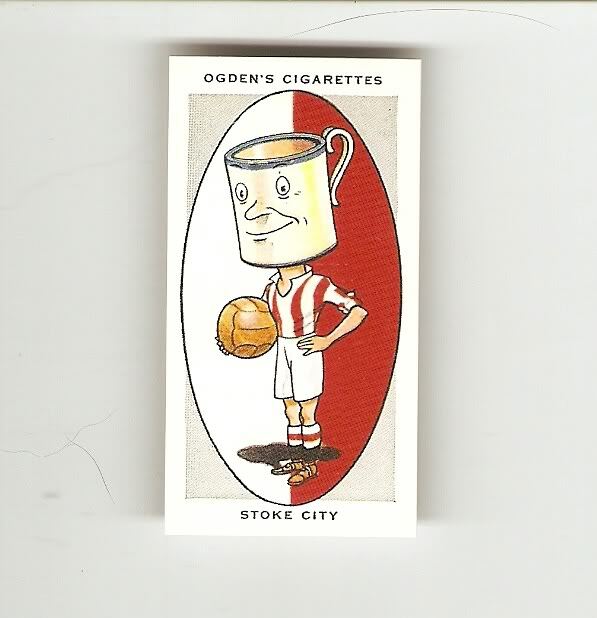 Ive shown below a football cigarette card from the Ogdens AFC Nicknames series that shows a caricature of the most commonly known nickname for Stoke City, The Potters. "Stoke City is the chief club of the pottery district,andits players areknown as the "Potters". One of the oldestclubs in the country, the whole development of football, the acceptance of professionalism and the introduction of the League system may be traced through itsrecord. But the "Potters" have had a chequered career, passing from the topto the bottomof the League and then back again.In their recovery they made their way from the Northern section of the Third Divisionto the Sceond in 1927, and in season 1932-33 they gained promotion to the First. Although regular challengers for the Cup they have only once survivedto the semi-final round.". So there you have it, the very briefest of explanations but dont worry I will be coming back to this page to expand on those sketchy details a bit more ! !